ConforPedic™ Conforms To Your Horse! ConforPedic™ material becomes softer in warmer areas where your horse’s body is making the most contact with the surface and remains firmer in cooler areas where less body contact is being made. As your horse moves, the material rises and lowers to meet your horse’s back and your saddle…eventually filling any gaps along the contour of the back of your horse and your saddle. As the material molds to your horse’s and saddle’s shape, your horse is protected from the potential rubbing of your saddle's bars as you benefit from a more comfortable ride. How Does ConforPedic™ Protect Your Horse? Acting like a very thick fluid, ConforPedic™ material doesn’t compress in the classic sense, it absorbs and redistributes the load. ConforPedic™, like other fluid or fluid-like materials, is also reactive to heat and pressure. It becomes significantly softer and flows more readily when the material is warmed close to body temperature than the material which remains at ambient temperature. This variable degree of viscoelastic stiffness results in the material molding to the body. Body weight is so effectively distributed over the body contact area that gross pressure is markedly reduced to therapeutic levels. Although there are obviously variances in interface pressure at different parts of the body, the pressure is distributed so evenly that there are minimal pressure spikes. Pressure spikes can result in high pressure gradients which can be measured by using certain pressure mapping systems. It is these gradients that work like “dams” which shunt blood flow and affect tissue perfusion. The larger the gradient, the more likely there will be tissue damage over time. ConforPedic™ impact reduction material is a breakthrough in equestrian technology that will forever change the way your horse performs. The original formula was developed in the early 1970's at NASA's Ames Research Center in an effort to relieve astronauts of the incredible g-forces experienced during lift-off. Aero Corporation spent almost a decade and millions of dollars researching and experimenting with the NASA material before discovering a way to produce a consistent and durable product. ConforPedic™ material is a high density, fluid-like viscoelastic, open-celled, breathable media. 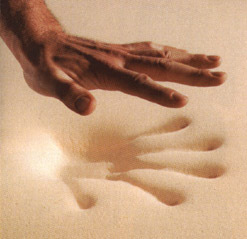 Similar to bed foams like Tempur-Pedic, but developed for military and aircraft impact reduction applications, it is unlike any other impact reduction material on the market. 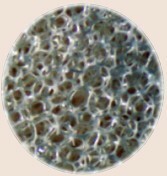 The cellular structure of the ConforPedic™ impact reduction material™ is completely different. It's made up of billions of high density, viscoelastic, memory cells. The cells are spherical with windows, and the key is…they're temperature sensitive. In warm areas, they get softer and pliable. In cooler areas, they stay firm. The cells will literally shift position and reorganize to conform to your horse’s body contours. Visco: resistant to change of shape. Elastic: able to return to its original shape after being forced to change. Imagine lying on a surface that knows exactly how far to let you "sink in" so that every point on the contour of your body is supported. The surface then "flows" back to its original, flat shape… much like pushing your hand into the surface of a bowl of water. The water would flow to fill every contour and crease of your hand, then return to its original shape once your hand is removed. The most common material used in saddle pads is high resilience (HR) foam. When a load is applied, HR foam compresses. At some point, the resistance to compression exceeds the weight/force of the load being applied and the foam begins to “push back”. Since this resistance is not uniformly distributed, (the horse’s body has curves and angles) pressure spikes result.